Santa Isabel, the wife of King Dinis, was so enchanted with Óbidos during a visit in 1278 that the king gave it to her for her dowry. (The tradition of presenting this town as a bridal gift continued until 1833.) Queen Leonor, wife of João II, lived here for several years mourning her only son and heir, who died in 1491 following a riding accident. The castle was built by king Afonso Henriques in the 12th century as a defensive fortress against the Moors. Converted into a royal palace in the 16th century, it later became a governor’s quarters. Óbidos was the first castle to be converted (1951) in the Portuguese pousada system. Even with the addition of eight more rooms in 2012, it’s essential to book far in advance at this pousada. If possible, go for one of the more atmospheric suites in the tower. 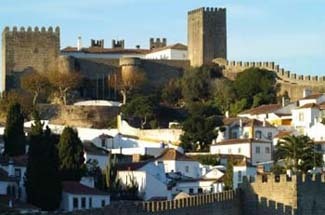 Óbidos is 94 km north of Lisbon and is accessible by train and bus. The pousada is at the end of the main street inside the old town. Parking is outside the castle walls. Do not leave anything in your car. Óbidos has always been known primarily for the charm of its narrow streets, whitewashed walls, and ironwork. As in other Portuguese towns, brilliantly colored potted flowers and birdcages abound. Entry into the old town is through a narrow double gate, lined by 18th-century azulejos. One long main street, bordered by Renaissance and baroque houses and bright with flowers, enters the old city. Craftsmen sit outside weaving carpets, a local handicraft specialty. During cold weather a big granite fireplace warms the castle’s lounge, which is furnished with 18th-century antiques (including a suit of armor), carved furniture, and leather high-back chairs. Charming handcarved and restored antiques fill the three suites located in the rampart towers. Six other guestrooms are very small, with wood-beamed ceilings and brightly colored bedspreads. Bathrooms are accented with hand-painted azulejos. The dining room is attractively decorated in brown on beige with hand-painted tiles, ceramics, and copper and brass plates. It features regional specialties such as baked fish and veal steaks, and the house white wine comes from local vineyards. The medieval town of Óbidos is a Portuguese National Monument.